Luminato will present the Canadian premiere of the avant-garde opera Einstein on the Beach by Robert Wilson and Philip Glass. Photo by Lucie Jansch. As Toronto joyfully transitions from winter to spring, art lovers begin thinking about another type of season—the festival season. Right on cue, the sprawling beast of art, creativity, and crowds that is Luminato has released information about the programming for its sixth edition, taking place this June 8 to 17. Likely to be one of the biggest draws at this year’s festival is the avant-garde five-hour “fusion of sound, image and movement,” Einstein on the Beach, by Robert Wilson and Philip Glass, which will be remounted in Toronto 20 years after its last production. It’s the first time the piece has been staged outside of New York, which is meaningful, since Glass wrote most of it in an old farmhouse in Cape Breton in the 1970s. Tickets will cost $25. That’s $5 per hour of opera. “Any seat left empty in the Sony Centre will be a personal failure,” Weisbrodt said. 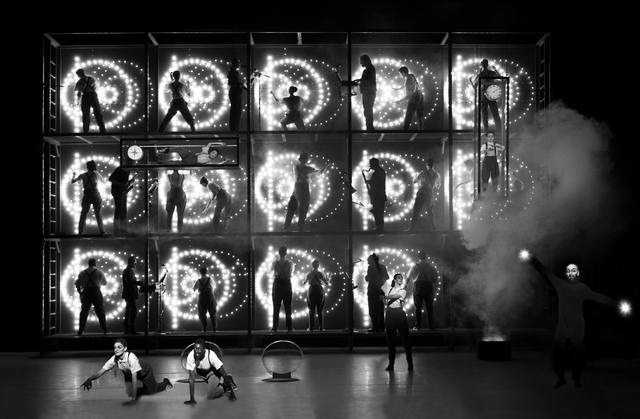 Rounding out the theatre and dance program is Robert Lepage’s highly anticipated Playing Cards 1: SPADES, the first in a series of in-the-round productions inspired by a deck of cards. SPADES will explore themes of war, illusions, and risk, jumping back and forth between Las Vegas and Baghdad. Weisbrodt said he’d seen a preview, which he called “a tornado of a production.” Literally: there is a tornado in the show. Montreal theatre companies Théâtre du Nouveau Monde and Lemieux Pilon 4D Art will present their multimedia jawdropper, La Belle et la Bête, a contemporary retelling of Beauty and the Beast in 3D (no glasses necessary). It will be the production’s English debut. Finally, Israel’s Batsheva Dance Company will present the North American premiere of Sadeh21, choreographed by artistic director Ohad Naharin in his own unique physical language, which he calls Gaga. Plans for Windscape at Pecault Square, the inaugural year for the square to be the cultural hub of the festival. 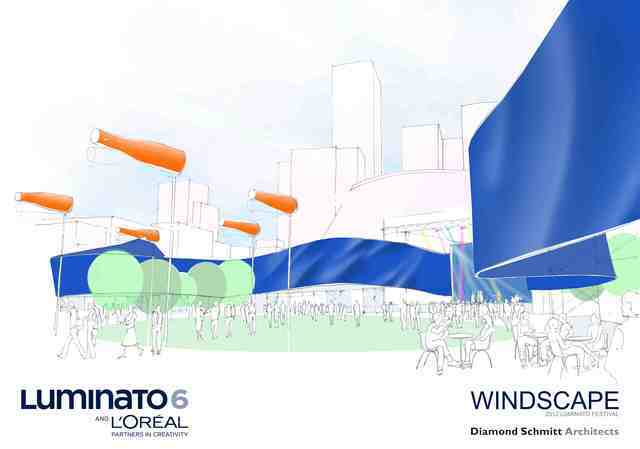 It will feature daily Illuminations, nightly concerts, and a "windsock ballet" that will occur every half an hour. Image courtesy of Diamond Schmitt Architects. Most of the music programming falls in the classical, folk, or cultural categories. There will be concerts by Michael Franti, Rufus Wainwright (he’ll be presenting the Canadian premiere of his new album, in fact, with special guests), Dan Mangan, Kathleen Edwards, Lemon Bucket Orkestra, Shantel and the Bucovina Club Orkestar, and a kick-off concert with K’Naan and Rae Sun, in Pecault Square. Closing out the festival will be the first open-air concert by the TSO in about ten years, where they’ll perform Tchaikovsky’s rousing 1812 Overture and Philip Glass’s brand new Overture for 2012, in commemoration of The War of 1812. Luminato is a known supporter of the Wainwright/McGarrigle clan, and this year is definitely no different. Besides showcasing Rufus’s newest album, the festival will also be holding a tribute, called Love Over and Over: The Songs of Kate McGarrigle. It will feature 20 musicians, all family or friends of McGarrigle, in a concert of her music. Performers will include her sisters Anna and Jane, her kids Rufus and Martha, Bruce Cockburn, Mary Margaret O’Hara, Emmylou Harris, Kevin Drew, Andrew Whiteman, Ariel Engle, and Amy Millan. And for the music lover with guts, concert pianist Stuart Goodyear will perform The Beethoven Marathon, which is exactly what it sounds like. On June 9, Goodyear will perform all 32 Beethoven sonatas in one day. That’s 103 individual movements, and over 10 hours of music, accompanied throughout the performance by Indonesian performance artist Melati Suryodarmo. The Literary series includes a number of impressive names, like Irvine Welsh on his prequel to Trainspotting, Linden MacIntyre, Vincent Lam, Chris Cleeve, Alice Munro, Lewis Lapham, Young Jean Lee, Adam Gopnik, Calvin Trillin, and too many more to name all at once. Festival favourites like 1000 Tastes of Toronto and Luminato’s “Magic” series will return. There will also be a series of discussions and visual projects to celebrate the anniversary of The War of 1812—including The Encampment, an installation of 200 white tents at Fort York that has a call out for public participation. More information can be found on Luminato 2012’s website, which will fully launch on April 5.